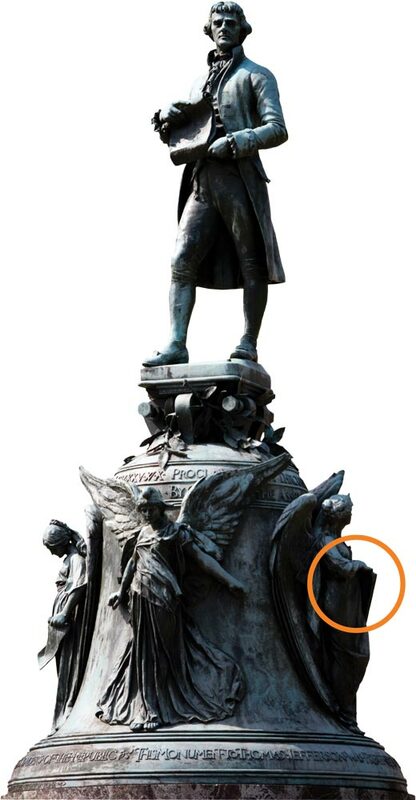 The names of various deities are carved into a tablet held by one of the Jefferson statue's symbolic spirits (circled in orange). 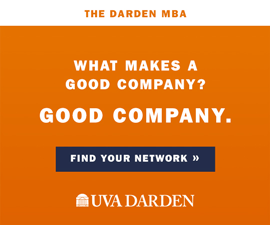 Most everyone at UVA has walked by the Jefferson statue in front of the Rotunda, but few have examined the statue’s small details. 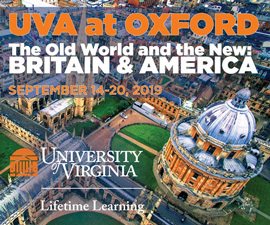 W. Scott Harrop, an adjunct lecturer in UVA’s department of Middle Eastern and South Asian languages and cultures, says he was astonished when a visiting professor pointed out a curious feature of the statue. 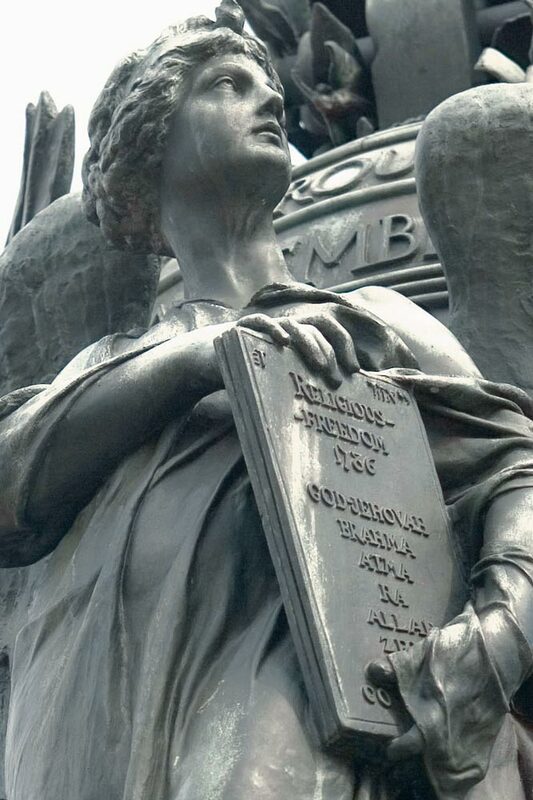 The names of various deities—God, Jehovah, Brahma, Atma, Ra, Allah, Zeus—are carved into a tablet held by one of the statue’s symbolic spirits, who represents religious freedom. As Harrop wrote in UVA’s Middle Eastern and South Asian Languages and Cultures newsletter, the subject of religious freedom had especially poignant meaning to Ezekiel, who was born in 1844 in Richmond to a family of Sephardic Jews and faced anti-Semitism through much of his life. This particular spirit represents religious freedom. Carved into the tablet she holds are the names God, Jehovah, Brahama, Atma, Ra, Allah and Zeus. Ezekiel was the first Jewish man to enroll in the Virginia Military Institute, where he became close friends with roommate Thomas G. Jefferson, a great-nephew of UVA’s founder. They continued their friendship on the battlefield, where Jefferson died in Ezekiel’s arms as the future sculptor read aloud from the Gospel of John. Eight years after Jefferson’s death Commodore Uriah Levy and later Congressman Jefferson Monroe Levy stepped up to save Monticello from decay and destruction in recognition of Judaism’s commitment to preservation and multiculturalism.